Welcome Offer: Get 35,000 welcome points after you spend $3,000 in first 3 months and we’ll waive the $150 annual fee for the first year*. Welcome offer: Get 35,000 points and the $150 annual fee waived in the first year (250$ value* towards a flight booked on bmorewards.com + 150$ Value*). Complimentary membership in Mastercard Airport Experiences provided by LoungeKey, with exclusive VIP access, plus four annual complimentary passes* ($140 Value/Year). This card comes with a comprehensive insurance package, good earning potential and a great promotional offer (35,000 bonus points if you spend $3,000 in the first three months!)1. There are very few limitations on what qualifies as an eligible purchase, and the accelerated points rate on travel, dining and entertainment purchases enables you to quickly redeem a nice reward. When it comes to redeeming points for travel or merchandise, you have a plethora of rewards from which to choose. Or if you can't choose, simply use your points to pay down your credit card balance. So, how does this card stack up to other rewards options? We crunched the numbers using our Best of Finance methodology to see how much you could earn over a 24-month period. Total (subtracting annual fee): $658.75. Receive 35,000 welcome bonus points when you spend $3,000 in the first three months of cardmembership1,1b. Earn three BMO Rewards points for every $1 you spend on travel, dining and entertainment purchases2a,2b. Earn two points for every $1 you spend everywhere else2b. There are very few restrictions on how you can redeem your points! If you choose to spend your points on travel rewards, you can redeem for flights, hotels, car rentals, cruises and vacation packages. BMO Rewards points cover all flight charges including taxes, and there are no blackout dates. You can also redeem points for a wide selection of gift cards and merchandise. 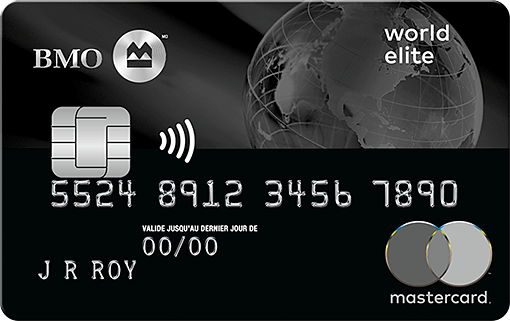 One unique feature of this card is the ability to redeem points for a contribution to a BMO Investment account. If you can't choose from the options above, you can simply use points to pay down your credit card balance! Enjoy membership to Mastercard Airport Experiences provided by LoungeKey, with four annual complimentary passes to the exclusive airport lounge3. Get access to an impressive suite of travel and medical insurance (unlimited trips per year)6. BMO World Elite Travel and Medical Protection means you are covered should an emergency or unexpected event disrupt your trip, for out-of-country medical expenses (up to $2 million) and for car rental collision damage6. Purchase protection means that any items bought with your card are insured against theft or damage within 90 days of purchase5. Extended warranty coverage doubles the original manufacturer's warranty up to one additional year, for anything you buy on this card5. At $150 per year, the annual fee is a bit higher than most rewards cards with a similar earning rate4. You earn three BMO Rewards points for every $1 in eligible travel, dining and entertainment purchases, but if you exceed $50,000 in combined annual purchases, this will drop to one point for every $1 spent thereafter. So if you're a big spender, this may not be the card for you2a,2b. The high eligibility requirements mean this card is unavailable to many consumers. You must have a minimum annual income of $80,000 (individual) or $150,000 (household) to be eligible for this card.